With excitement mounting for the new Dukes Hotel, Dubai nestled on the trunk of Palm Jumeirah, we took 5 minutes with Carl Chapman, the Food & Beverage Director of this hotly anticipated new project to chat through his vision for the hotel and some of the amazing new restaurants we can expect to see. Lovely to meet you Carl. So what does your role as the new F&B Director for DUKES Dubai entail? First and foremost, my role is to ensure the successful opening of DUKES Dubai’s exciting new food and beverage operation. We have worked hard to carefully select a talented team of leaders and colleagues who we know will be able to communicate the DUKES brand vision and engage with Dubai’s discerning dining community. A big part of my role is to lead, motivate and train the team so that we can deliver on the DUKES Dubai commitment to quality, excellence and culinary innovation across all areas of the operation, so that we launch with a fanfare and continue to engage, impress and delight our guests. Do you see there being a strong demand for quality, British cuisine in Dubai and why do you think this is? With the opening of DUKES Dubai we have a unique opportunity to showcase the best of British cuisine. The Dubai community already has extremely high standards along with an educated palate, and we aim to match this to the style and sophistication of our British-themed and entrenched culinary offering, matched with the same levels of service as you would expect from any top UK restaurant. We also have the advantage of being able to use the ‘dna’ from our sister and flagship brand property, DUKES London, to create a unique offering within the Dubai marketplace. There is just a handful of restaurants with a true British concept here in Dubai, and with a strong Brit expat population, as well as visitors, plus a strong following in general for British cuisine from other nationalities, recent offerings in the emirate have been very well receive; and we plan to leverage this through our own collection of dining venues. How will DUKES Dubai and it’s respective F&B outlets differentiate themselves in a competitive marketplace where around 4 new outlets open a day? With four new outlets opening in Dubai every day it’s not about the quantity but all about the quality. We will bring an understated elegance to our outlets, shown through the carefully selected products that have been procured, the service delivery of our highly talented team and our carefully curated menus. We want to ensure that we are an accessible destination and our pricing strategy will reflect this. There is already significant excitement in the marketplace ahead of our opening and we believe that we have something for everyone, whether it’s lunch in the vibrant setting of the Great British Restaurant, an elegant afternoon tea experience at DUKES Tea Lounge, the perfect martini in DUKES Bar or an authentic North Indian experience in Khyber, located on the 15th floor of the hotel and offering breath-taking views. 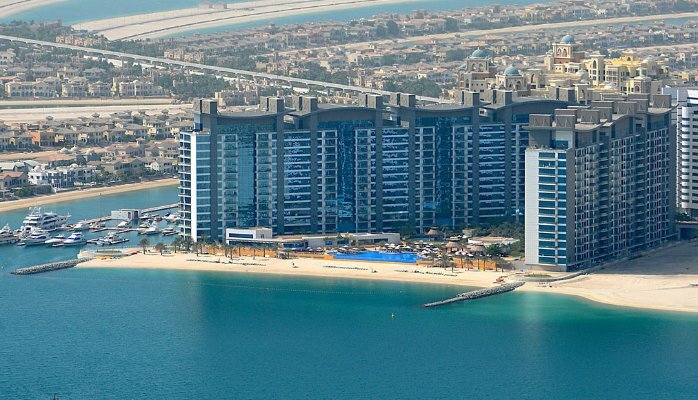 What will the opening of DUKES Dubai mean for the Palm Jumeirah itself? We are bringing a very different concept to the Palm Jumeirah that will complement the existing collection of hotel brands and dining options available. Our location on the trunk of the island is great for easy access to those coming from the city, whilst it’s also a new location to explore for residents and visitors from the fronds and crescent communities. Engagement with the communities on our doorstep, such as Ocean Beach Residence, Shoreline Apartments and The Golden Mile, is extremely important as we want to be a social hub for residents and visitors, as well as add a new level of creative dining destinations to Palm Jumeirah. Tell us a little about the F&B outlets that DUKES Dubai will have? Our Great British Restaurant (GBR) will be a destination restaurant with a spectacular design, and will offer the best of British cuisine from breakfast through to supper. Ascending one of our two striking staircases from lobby level, the DUKES Bar will be the home of our signature Martini, along with an extensive cocktail menu. The third floor will house two very distinct destinations with the Tea Lounge serving a classic English afternoon tea, and transforming by night into a Champagne lounge with two private terraces. A gentlemen’s favourite, the Cigar Lounge will offer the understated sophistication of a private members only club featuring an excellent selection of fine cigars and malts. On the 14th floor post-pool relaxation refreshments will be available and on the top floor we will have Khyber. This will be the first Middle Eastern outpost for this iconic Mumbai-based restaurant; serving cuisine from the North-West frontier province of India. Last but not least is West 14, our award-winning steakhouse, which serves premium cuts of beef from all over the world as well as other delicacies. The breathtaking views of the sea and the Dubai skyline can be enjoyed from the terrace. So there you have it, just when you thought Dubai couldn’t possibly need any more restaurants, you realise that perhaps, just perhaps, it does.